The next upcoming Armed Forces Day is on Saturday May 18th, 2019. Armed Forces Day is held annually on the third Saturday of May. It is a time to honor the men and women who currently serve in the armed forces in the United States. 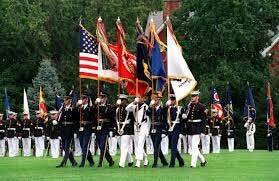 Armed Forces day culminates the end of Armed Forces Week in which each branch of the military is honored on a separate day of that week. Veterans Day honors all those who have previously served in the military. We honor those men and women who have died serving in the United States Armed Forces on Memorial Day. Armed Forces Day pays tribute to all who serve the armed forces, both in war and peace. This includes the Navy, the Army, the Air Force, the Marines, and the Coast Guard. Many military displays are open for the public to educate them about the armed forces. Other events might include parades, motorcycle "Support the Troops" themed rides, and a time of remembrance at military cemeteries with music to respect those who died for their country. The United States' Secretary of Defense, Louis Johnson, created an Armed Forces Day in 1949 to replace the separate Air Force, Navy and Army days. On May 20, 1950 the first Armed Forces Day was celebrated. It was a day to educate the public of the jobs performed in the armed forces and their role in civilian life as well as the "state-of-the-art" military equipment. It also paid tribute to the those serving in the armed forces.